Conducting Post Mortems on behalf of SAMGA one often comes across the odd interesting case as happened here while investigating Angora Kid deaths. These young kids (less than 2 months old) were running with ewes on old zero grazing lands during drought conditions. On Post Mortem on one of the kids had a hairball obstructing the pyloric outlet (obstruction between the abomasum outlet into the small intestine), also called a bezoar. The term bezoar refers to an intraluminal mass in the gastrointestinal system caused by the accumulation of indigestible ingested materials. Bezoars are named according to the material they are made so as in this case of the Angora goat kid it would be called a Trichobezoar. Trichobezoar is a concretion form of hairs found in the gastrointestinal tract due to frequent ingestion of hair. What causes Angora goats to swallow hair? *(Akgul et al 2000; Youde and Huaitao 2001; Meyer and Lohse 2002). 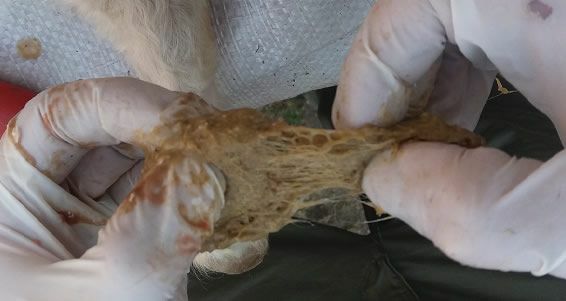 Ingested hairs become balled-up in the rumen due to rumen motility and may pass into the intestinal tract and cause obstruction or obstruction in the pyloric outlet. How can a farmer prevent hairballs forming? Increasing the amount of dietary fibre and ensuring the fibre is of adequate length is recommended. On this basis the feeding of roughage at 0.5% bodyweight daily as a supplement to pellets is recommended (causing the animal to chew, salivate and ruminate). Minimising periods of feed deprivation are also recommended. It is interesting to note that research by Bath, Botha and Vorster on bezoars in Angora goats and sheep that the diameters of fibres from phytobezoars varied between 2 and 30 microns. These diameters were very similar to those of the pappus hairs surrounding the seeds of the Karoo bushes Chrysocoma ciliata, Eriocephalus ericoides and Gnidia polycephala. The microscopic structure and ultrastructure of these pappus hairs moreover closely resembled the fibres of bezoars but were quite distinct from that of hair or wool. The chemical composition of bezoars found in goats and sheep, resembled that of pappus hairs and stems of the Karoo bushes Eriocephalus ericoides and Gnidia polycephala more closely than that of mohair. Ash, nitrogen, phosphorus and zinc concentrations in both bezoars and plant material were similar, but very different to that of mohair; however, the calcium, magnesium, potassium and manganese levels of bezoars were more similar to mohair than plant matter. Hairballs as a Cause of Anorexia in Angora Goats. J S Afr Vet Assoc. 1992 Sep;63(3):103-7.Physical structure and chemical composition of abomasal phytobezoars of goats and sheep. Bath GF1, Botha P, Vorster HJ, Cross RH.